"Coolwater" was the dam of our Waterbabies. We were very fortunate to lease her from Charles Tyson and will always be grateful for this opportunity. Her daughters included Best in Show Can. Am. CH Lythe Sea of Dreams, "Lizzy," owned by Caroline Thibodeau; SBOS and multi-group placing CH Lythe Wild Sargasso Sea, "Tess," owned by Sharon Robinson; and our own wonderful producer Group and specialty winning Can. 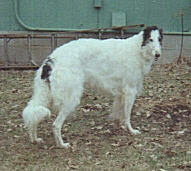 CH Lythe Mississippi Mermaid, "Maida." Sweet "Sophie," better known as "Cupcake," gave us the opportunity to double on the Stillwater lines through her dam as well as bring in the Triumfus Dyonisos bloodline, through her granddam Tamara v Triumfus Dyonisos, and the excellent producer BIS Int. Germ. 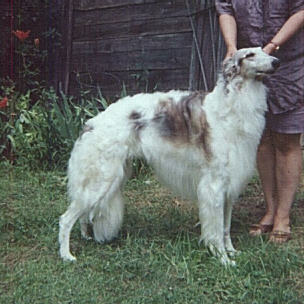 VDH CH Sholwood Silver Fox, her grandsire.